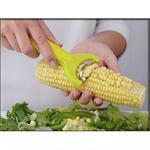 This Corn Cutter has a stainless-steel cutting blade that expands or contracts depending on the diameter of the ear of corn. 10" in length with comfort grip handles and stainless steel cutting teeth. 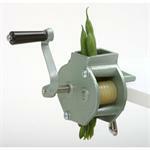 Whether you have a bushel or just a few cobs, it will make quick work of removing the kernels. The compact size fits comfortably in the palm of your hand as you apply gentle pressure while running the stainless steel teeth lengthwise up the cob. The Gusto Flavor Infusing Spoon allows you to infuse the rich flavours of spices into your broths, soups and stews when stirring. 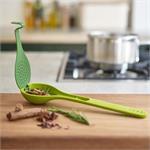 The integrated herb stripper in the handle makes quick work of removing the leaves from rosemary stems and more. Zip! and rows of corn come off the cob. 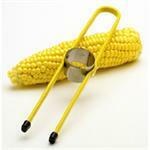 The original corn zipper has two-pronged teeth, on the back. 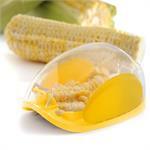 It cuts kernels off the cob as you pull it down the rows. 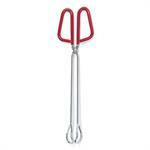 The Y corn zipper removes more corn at a time; it removes 3 to 4 rows at a time. 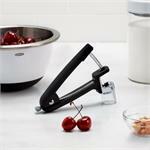 The OXO Good Grips Cherry Pitter easily removes the pits from cherries and olives. 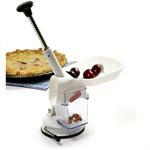 Place the cherry or olive on holder and press the soft grip handle together to pop the pit out cleanly. 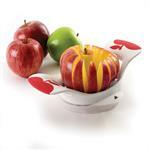 The splash guard keeps splatter directed downward. 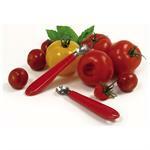 These all-purpose Serving Tongs are perfect to use when canning. 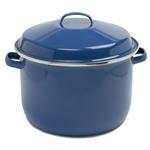 The generous length reaches deep into pots to grab corn cobs or canning jars from hot water. Slightly rounded ends easily grab hot dogs and smokies. 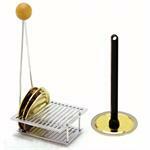 The chinois has come full circle from great grandma’s time to the current day to help you easily prepare soups, stock, sauces, baby food, desserts and more. 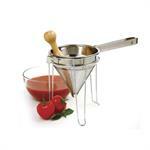 Three piece set includes stainless steel chinois, rubberwood pestle and chrome stand. A customer favourite! 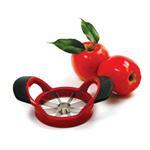 A simple little tool that easily removes the hull and stem from tomatoes and strawberries. 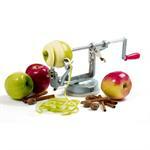 Constructed of stainless steel teeth with a heavy duty plastic handle. 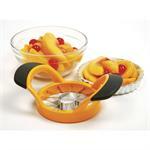 The perfect no-work, no-mess way to extract juice and make jellies. 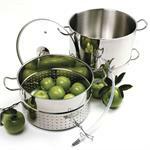 Multi-functional set ca also be used for a stock pot, blancher, roaster, & large colander. 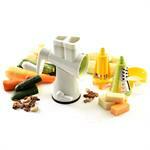 6 essential tools for all your canning and dehydrating. 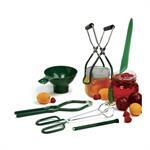 Includes magnetic lid lifter, tongs, jar wrench, bubble popper/measuring tool, wide mouth canning funnel, and jar lifter. 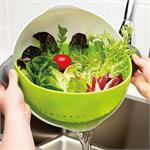 Use this 12" diameter rack for water bath canning with the porcelain enamel canning pot #588-N. Designed to keep jars from touching during canning. 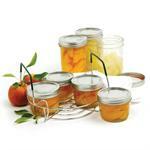 Holds 7 quart or 7 pint jars. Oops, you’ve cut up enough for 9 quarts and your canner only holds 7. Small canning rack to the rescue! 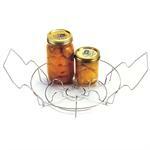 This rack will fit into any stockpot and holds 4 quart or 2 pint sized sealers. 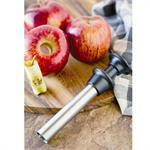 Safely remove canning lids from boiling water with this 7" long magnetic lid wand. 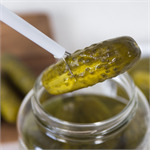 It helps to keep the lids sterilized by not having to touch them until they are placed on the jar. 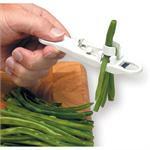 Don't put it away after canning as it also picks up pins and paper clips. 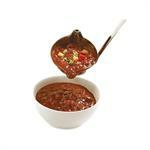 Stir, scoop, pour and serve with this long handled canning ladle. 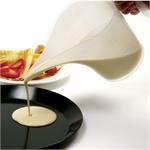 The dual spouts allow you to pour from either side, working easily for right or left handed people. The hooked handle rests on the side of the pot to keep it from falling in. 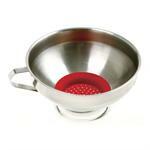 Stainless steel funnel with a 5 1/2" opening includes a removable silicone strainer. 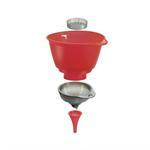 This dual purpose funnel saves on mess and frustration - it is a must-have for canners.